(MODEL RELEASED IMAGE). 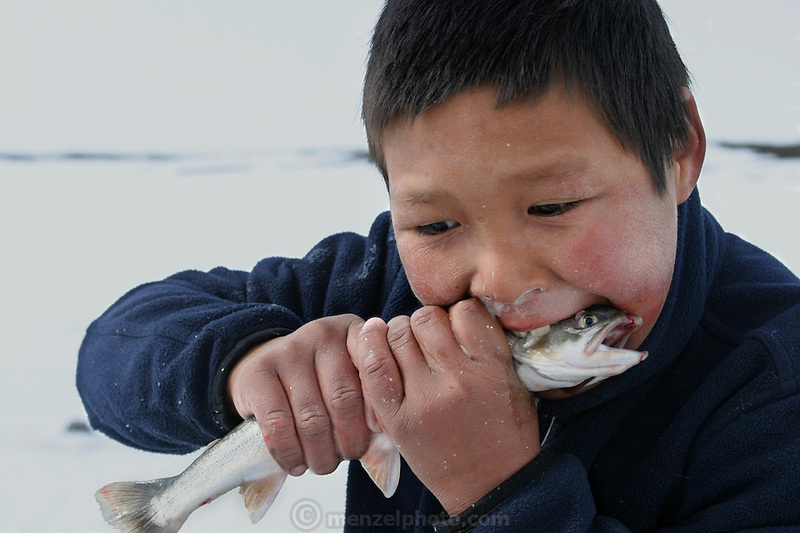 Emil and Erika Madsen's nephew Julian bites down on an Arctic char, half in jest, for the camera because the fish is large, but locals say that children often eat small fish raw. It's said to "tickle their bellies." After chopping holes in the ice with a pike, family members lower down hooks baited with seal fat. When the char bite, they yank them out of the hole with a practiced motion. (From a photographic gallery of fish images, in Hungry Planet: What the World Eats, p. 204).